A detachable hardtop is a removable roof section that transforms a convertible or roadster into a reasonable approximation of a closed coupe. Detachable hardtops date back at least to the early 1920s, when they were commonly known (for reasons now obscure) as “California tops,” and tended to be semi-permanent installations. Roadster owners would have the top bolted on in the fall and then removed come springtime. Roadsters of the fifties and sixties offered detachable hardtops as either adjuncts to or replacements for soft tops. On the original two-seat Thunderbird, for example, you could choose either the detachable top or the convertible top at no cost, but you paid extra for both. Detachable hardtops are still offered as accessories on some convertibles, although they are rapidly losing favor to —Retractable hardtops, which have articulated metal roofs that retract completely into the body. This crowd-pleasing party trick was popularized by Ford with its 1957-1959 Skyliner, although it was tried decades earlier with mixed results — Peugeot, for instance, offered a power-operated retractable hardtop on the 402 back in 1935, although it was dreadfully unreliable. The Ford Skyliner was a truly impressive piece of work, but its cost was high, the complexity of its mechanism (which had 10 power relays, seven motors, and enough wire to stretch the length of a football field and back) was daunting, and the retracted top ate most of the trunk space, so Skyliner sales were understandably limited. Mitsubishi revived the concept more than 30 years later with the short-lived 3000GT Spyder of the mid-1990s. This, too, was an impressive exercise, but it nearly doubled the 3000GT’s already hefty sticker price, so there were few takers. In the past few years, however, the “retrac” has become all the rage, offered on mass-market cars like the Peugeot 206CC/207CC and Volkswagen Eos as well as the chic Mercedes SL and SLK. The appeal is understandable: combining coupe security with the ability to put the top down when you want it. Nevertheless, the prospect of fixing them when they break or the seals wear out is not a happy one. Nor is the weight penalty, which usually amounts to around 400 pounds (182 kg), compared to perhaps 150 extra pounds (68 kg) for a typical soft top. All but extinct is the once-popular pillarless hardtop: a closed coupe, sedan, or (very occasionally) wagon with no B-pillars. (In automotive parlance, the front roof pillars are A-pillars, the roof supports immediately aft of the front seats are B-pillars, the pillars aft of the rear seat (if any) are C-pillars.) The original intent of the pillarless hardtop was to create the appearance of a convertible with the top raised, and in fact early hardtops were essentially convertible bodies with permanent roofs attached. These, too, go back to at least the mid-1930s, although the style was popularized by GM, starting with the 1949 Buick Riviera. According to legend, the Riviera hardtop was suggested by Ed Ragsdale, then Buick chief engineer, whose wife always drove convertibles because she liked the look, but never lowered the top because the wind would mess up her hairdo; in fact, Buick designer Ned Nickles came up with the idea, which existed in model form by late 1945. Regardless of its conceptual origins, the Riviera hardtop was very popular, and was quickly imitated by every other American manufacturer. Initially, most hardtops were two-door coupes, but by the mid-fifties, the style was applied to four-doors and even a handful of station wagons. Early hardtops stressed the “hardtop convertible” look (the early Chevy Bel Air hardtop even had fake “bows” in the interior headliner to look like a raised convertible top), but it soon became clear that buyers liked the airy, open look of the pillarless roof for its own sake, without any such gimmicks. By the sixties, pillarless two-door hardtops were usually the most popular model of any series, and hardtop coupes still carry the highest prices as collector’s items today. Pillarless hardtops look good, but the absence of the B-pillar reduces structural integrity, and tends to create problems with side-window sealing, particularly on four-door sedans. Hardtops had to have some of the same body and chassis reinforcements given convertibles, which made them somewhat heavier than a comparable pillared sedan. 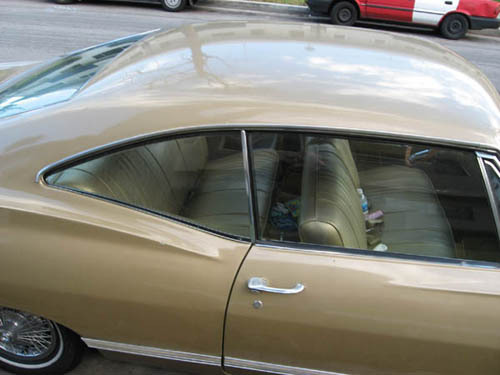 Hardtops fell out of fashion in the U.S. in the mid-seventies, largely because automakers were fearful of proposed federal roof crush standards. A similar standard — overturned by a federal court prior to enactment — had already (temporarily) killed the convertible in the U.S. market. Convertibles returned in the eighties, but American manufacturers never really revived the hardtop body style. Ironically, most of the handful of hardtops on the North American market since then have been German — the BMW 8-series was a pillarless hardtop, as are the fixed-roof Mercedes Benz CLK and CL. Other than the aforementioned rigidity issues, there was no particular reason other manufacturers couldn’t adopt the style, so it may yet make a comeback. Author’s note: Since this article was originally published, the U.S. has enacted considerably more stringent roof crush standards. Convertibles are exempt from the regulation, but hardtops are not, which is likely to limit future pillarless body styles to more expensive cars that can bear the cost of stronger materials for the rest of the roof structure. A revival of the relatively inexpensive hardtops so common in the sixties now seems unlikely. Japanese where also fan of pillarless sedan in the 80’s. Sadly i can’t remember a french one, it’s such an intresting styling! The Japanese got into pillarless two-door hardtops in the seventies as well. A lot of the four-doors of the eighties and early nineties were actually “pillared” hardtops with concealed B-pillars and frameless door glass. Some of these were very artfully done, to the point where it’s hard to tell they have a B-pillar at all.